This Husky DP Pneumatic 23-Gauge Strip Headless Pin Nailer is great for custom applications such as hobby work, jewellery cases and detailed trim. 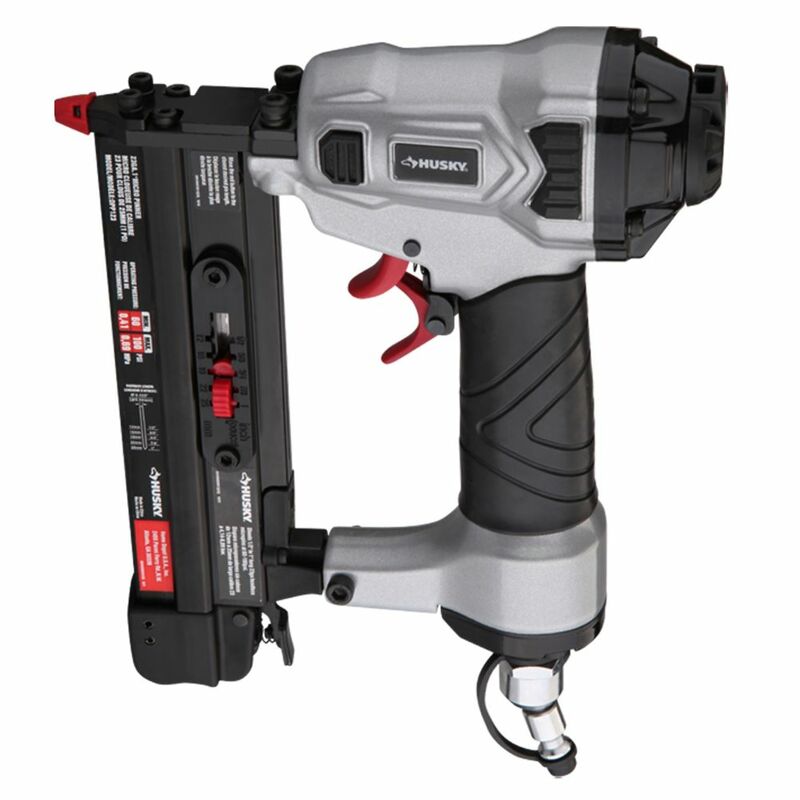 The nailer takes 23-gauge pins ranging from 1/2 Inch to 1 Inch long and operates at 60 - 100 psi. It features a die-cast aluminum construction with anodized aluminum parts for durability while remaining lightweight and soft grip handles to allow comfortable handling without loss of control. Includes anti-dust cap and internal air filter for clean operation. DP Series 23-Gauge x 1-inch Pin Nailer This Husky DP Pneumatic 23-Gauge Strip Headless Pin Nailer is great for custom applications such as hobby work, jewellery cases and detailed trim. The nailer takes 23-gauge pins ranging from 1/2 Inch to 1 Inch long and operates at 60 - 100 psi. It features a die-cast aluminum construction with anodized aluminum parts for durability while remaining lightweight and soft grip handles to allow comfortable handling without loss of control. Includes anti-dust cap and internal air filter for clean operation. DP Series 23-Gauge x 1-inch Pin Nailer is rated 4.5 out of 5 by 22. Rated 5 out of 5 by Glen from Great value, this pin nailer met all of my expectations.... Great value, this pin nailer met all of my expectations. Rated 5 out of 5 by Jason from I’m really glad I picked this up I wish I... I’m really glad I picked this up I wish I would have bought one a long time ago. Seems like good quality for the price.